FREETOWN, Nov 17 2014 (IPS) - The outbreak of the deadly Ebola epidemic in Sierra Leone has badly affected the West African country’s move towards meeting key development goals. Agriculture, which is the mainstay of the economy, has been the worst hit as many farmers have succumbed to the disease and many more have abandoned their farmlands in fear of contracting the virus. “We have lost hundreds of farmers to the Ebola epidemic and the regions where agricultural activities take place have become epicentres of the pandemic, such as Kailahun in the east and Bombali in the north,” Joseph Sam Sesay, the Minister of Agriculture and Food Security, told IPS. In early November, 4,059 people were killed by the virus. This surpasses neighbouring Liberia which, until a month ago, was the worst-hit country. Sesay said that 60 percent of the country’s six million people are engaged in agriculture but as a result of the crisis many are now unemployed. The sector, he said, also contributes to 60 percent of the country’s GDP. However, with the current epidemic, Sierra Leone’s prospect of meeting the millennium development goal of eradicating hunger and poverty is a far-off dream. “We had made significant gains before we were confronted with this Ebola problem. Food productivity had increased tremendously and local foodstuffs were plenty on the markets. We had even begun exporting cash crops to neighbouring countries, including rice, and cocoa. All these have been stultified,” Sesay added. When President Ernest Bai Koroma came to power in 2007, he made agriculture a key priority in his developmental blueprint, which he dubbed “Agenda for Change and Prosperity”. Bilateral partners, including China and India, have donated hundreds of tractors and other agricultural machinery to help boost the country’s move towards food security. But no farmers are working currently and experts predict that there will be food scarcity if the Ebola epidemic is not contained soon. “I have discontinued my farming activities temporarily. More than 15 of my colleagues have been killed by Ebola and I cannot risk going to the farm any more. The situation is frightening,” Musa Conteh, a farmer in Sierra Leone’s northern district of Bombali, told IPS. The health sector is also badly affected by the epidemic. Even though this West African nation has a free government healthcare scheme for children under the age of five, pregnant and lactating mothers; people are refusing to go to hospitals and peripheral health centres as they fear being suspected of having Ebola and being quarantined. However, many of the country’s doctors, nurses and auxiliary health workers are also fearful and have not been going to work. Sierra Leone has lost five medical doctors, more than 60 nurses and auxiliary health workers to Ebola. “It is a terrible crisis facing us. With our poor health infrastructure, we were certainly not prepared for this epidemic. Perhaps, with the intervention of our international partners, we may be able to defeat the disease much quickly,” Sierra Leone’s Health Minister Abubakar Fofana told IPS. He, however, said that even after the Ebola epidemic has been contained, the country will be faced with an upsurge in infant mortality because children are not being vaccinated for killer diseases at the moment. “The situation is worrisome,” he said. Sierra Leone had one of the worst infant mortality rates in the world with 267 deaths recorded per 1,000 live births just after the country’s civil war ended in 2002. In 2012 the infant mortality rate had more than halved to 110 deaths per 1,000 live births. In recent years, it had started making progress, with a free healthcare scheme introduced by Koroma. But the Ebola epidemic is sure to reverse all those gains. The outbreak of the epidemic has forced all schools and learning institutions to close. The government says it cannot put a timeline on when they will resume. The country’s educational system was considered to be at low, even before the outbreak of the deadly Ebola disease, with falling standards and persistent industrial actions by teachers. The Minister of Education Minkailu Bah told IPS that the Ebola crisis is having a dire effect on education and that this will be felt even after the disease has been contained. “Already, our children are not attending schools or colleges. Their future is uncertain and we do not even know how many drop-outs we’ll have on our hands if this Ebola crisis is not contained,” Bah said. The government has introduced a teaching programme, on radio and television, for school-going kids. But many say this is ineffectual. “I don’t think this will work. How many families can afford TV or radio and batteries in their homes? How reliable is the electricity supply? The kids today prefer viewing Nigerian films and watching football. 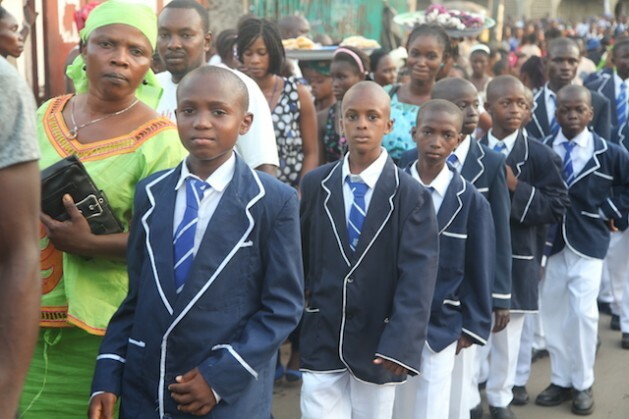 They are not interested in that teaching programme,” Michael Williams, a father of four in Freetown, told IPS. I got the power to wipe out Ebola and AIDS in just a few days – I got my WVD – The Weapon of Virus Destruction – Just an exercise for a minute a day – The cure and prevention of any diseases, known on Earth – Even Tibetans don’t know how to stay absolutely healthy all the time – The price of the WVD for the whole world is 5 billion EURO/BUCKS/BP.